Kevin Gilbert (centre) accompanied by his wife Anna, daughter Elizabeth and son Thomas. A well-known pig farmer is this year’s recipient of NFU Scotland’s (NFUS) north-east region Unsung Hero award. Kevin Gilbert, who farms at Womblehill, Kintore, is the immediate past chairman of the union’s pigs committee. 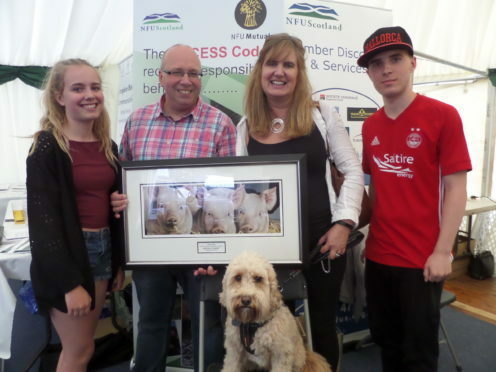 NFUS north-east region chairman Davie Winton gave Mr Gilbert the award and a limited-edition pig-themed print by Angela Davidson at the Turriff Show. He paid tribute to Mr Gilbert’s tireless work, his promotion of Scottish pork, and his recent work in raising awareness of mental health and wellbeing in the farming community.